A reimagined public space in the Museum of Contemporary Art Chicago (MCA) is being designed and built by Los Angeles–based Johnston Marklee and Mexico City–based Pedro&Juana. 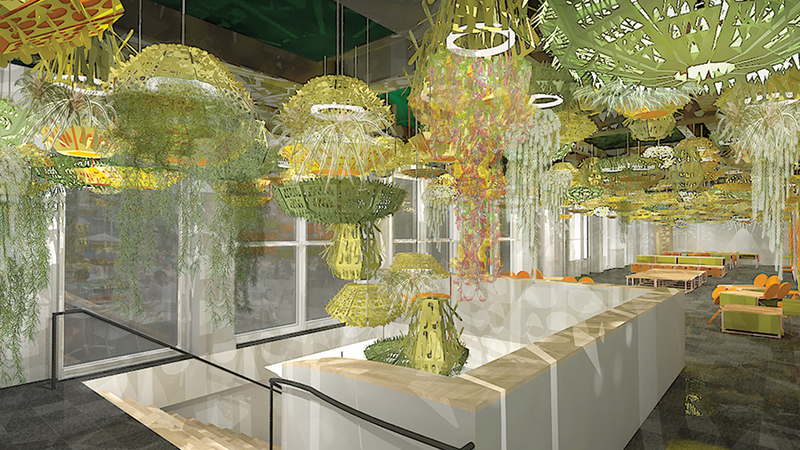 A new restaurant will also be designed by Turner Prize–winning British painter Chris Ofili. Pedro&Juana was introduced to Chicago through the 2015 Chicago Architecture Biennial, with its major installation in the Randolph Square space in the Chicago Cultural Center, entitled Dear Randolph. Like that installation, the social space the firm is designing for the MCA, which will be called The Commons, will be a colorful environment of large custom-made hanging elements. The space’s colorful planters and ornate chandeliers will be a stark departure from the normally austere spaces of the MCA. Sharon Johnston and Mark Lee, also the artistic directors of the 2017 Chicago Architecture Biennial, are leading the redesign. The entire $16 million project is expected to be completed by June of this year.